Add Android Support Design Dependency. Add Dependency From Module Settings. Add Dependency From Gradle File. Add Images in Drawable folder. Create Fragment One - To show images. Create Fragment Two to display contacts. Adding Fragment One & Fragment Two to Main Activity. This blog post gives you brief idea about how to implement tabs layout with ViewPager class in your Android Application. Before moving foward, I will suggest you to refer Android Tabs. 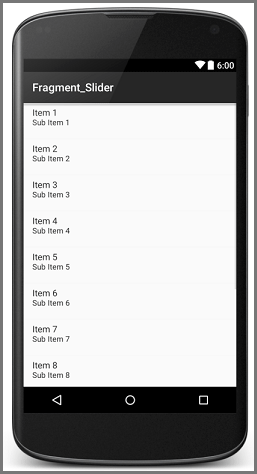 Tab Layout provides a horizontal layout to display tabs in your Android application. For more detail about Android TabLayout Click here. How to create Tab Layout in your Android app? 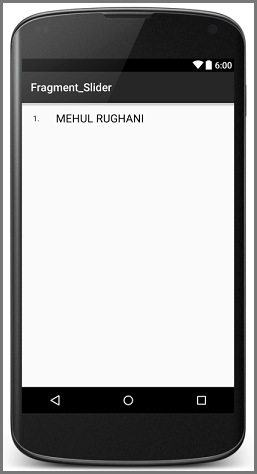 Follow these simple steps to create a horizontal tab layout in your Android app. In my example I will be displaying two tabs named One and Two. Tab One I would be displaying images. Tab Two I would be displaying few contacts. I will need to create two fragments for that. Step 1 Create New Android Project. Step 2 Add Android Support Design Dependency. 2.1 Add Dependency From Module Settings. Right click on the app and click on Open Module Settings. Now go to the dependencies tab and click on add (+) button and search for a support:design. Select android.support:design library and click ok.
2.2 Add Dependency From Gradle File. Displaying some text in tab Two. To Display Images I have to add few images in Drawable folder and take reference of those images in strings.xml file. In strings.xml file I have declared two string arrays, each representing items I would be using in my example. all_images Containing references of all static images. all_contacts Containing references of all the contacts. Now I am going to create color.xml file for storing required color references. Now, lets create fragments to show images and contacts. First I am going to create fragment which will display few images. Step 4 Create Fragment One - To show images. I would be displaying images in this fragment, for that I need to create layout which contains the images. So let’s get started with creating layout. 4.1 Create fragment_one.xml layout File. To create layout file, right click on app >> res >> layout and select New >> Layout resource file. Give appropriate name to that layout file. Here I am using fragment_one.xml. In my example, fragment_one.xml is used to display some static images in GridView. In this layout file, I have taken a GridView to display images (You can change the properties of a GridView as per your application requirements). I am done with putting GridView in my first fragment. Now i will add images in my GridView, which needs to inflate from another layout file. So I am going to create image_inflater.xml file. 4.2 Create image_inflater.xml layout File. I would be inflating this imageView (multiple copies) to the GridView that I have declared in fragment_one.xml (You can change the properties of imageview as per your requirements). I am done with my layout file for first fragment, so now let’s move towards the coding part of the first fragment. As the name suggests, this is a fragment file, so it extends Fragment class. In this file I have taken a reference of gridview (that I have declared in fragment_one.xml) and reference of all images from string.xml file. In this method, I am adding all the images (fetcehd from strings.xml in getAllWidgets() method) to allDrawableImages Arraylist. After that I have created an object of GridViewAdapter and called the constructor of GridViewAdapter with two arguments. Argument - 2 Drawable ArrayList (For images). Then I have set GridViewAdapter object to the GridView (for displaying all the images in GridView). We cannot add items in gridview directly, we need to do it through adapter. So I have created gridViewAdapter for that. Create GridViewAdapter.java file for adding items. Add it into the grid view. So I am ready with my first fragment, now let's move towards the second fragment. Second fragment will be used to display contacts which I have already declared in strings.xml file. Step 5 Create Fragment Two to display contacts. To display contacts, I need to first create layout which can contain the contacts I want to show. So let's get started with creating layout. 5.1 Create fragment_two.xml layout File. Create fragment_two.xml file in res >> layout folder. In my example I am using this fragment to display contacts. I am done with putting listview in my second fragment. But to put data in my listview, I’ll need to inflate the contacts from another layout file. For that I am going to create a contact_inflater.xml file. 5.2 Create contact_inflater.xml layout File. To inflate text I am creating contact_inflator.xml file with two TextViews. One textview will contain the name and the other is for number. I am done with my layout file for second fragment, so now let’s get started with the coding of second fragment. In this method, first I am adding all the contacts (fetched from strings.xml file) to allContactNames ArrayList. Then I have created an object of ListViewAdapter and called constructor of ListViewAdapter with two arguments. Argument - 2 String ArrayList (For Contacts). Then I have set the ListViewAdapter object to the ListView. Since we cannot add items in ListView directly (same as GridView) I am going to create an adapter for it. It will add the contact into listview. Finally, I am done with both of my fragments. So, now I will add both the fragments in TabLayout. So come back to the Main Activity of the project. In this tutorial, you can change tabs by swiping left or right if you don’t want this feature then you can click here. Step 6 Adding Fragment One & Fragment Two to Main Activity. In this file I have taken TabLayout. I am done with my main layout file now let’s check the code for the same. Now let’s understand setupViewPager() and setViewPagerAdapter() methods in detail. I have created an object of each fragment (which would be shown in TabLayout) to ViewPagerAdapter. Argument - 1 Fragment object that we have created. Argument - 2 Name that we want to show as title of the tab. After adding both the fragments to the adapter I am going to set that adapter to the ViewPager. I am ready with my viewpager so now I am going to set that viewpager to the TabLayout. Now to add fragment in viewpager I am going to create ViewPagerAdapter for it. Here I have created this file to add both the fragments in ViewPager widget. I hope you find this blog post very helpful while creating Tab Layout In Android With ViewPager. Let me know in comment if you have any questions regarding Tab Layout. I will reply you ASAP. 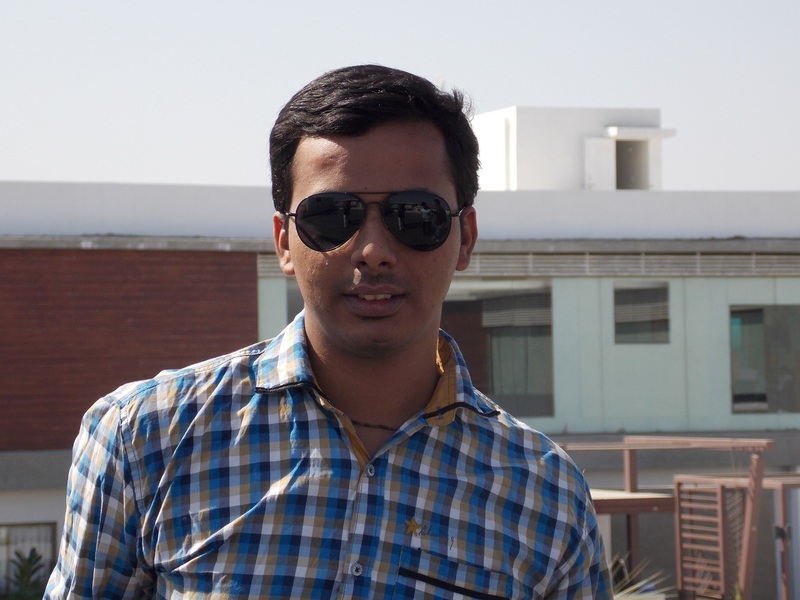 I am professional Android App & Game developer. I love to develop unique and creative Games & Apps. I am very passionate about my work.